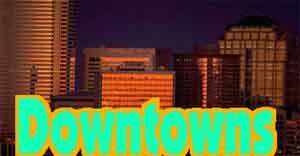 We have two sizzling features for you in this month’s Second Section Scrapbook: a collection of Downtown layouts, set among the towering structures of the city center, and a group of Updates, showing you recent developments on several excellent railroads we have previously featured here. I hope you’ll find some good ideas to spark your hobby activities during the summer months, and of course I hope our wintry Southern Hemisphere readers will warm to these notions as well. 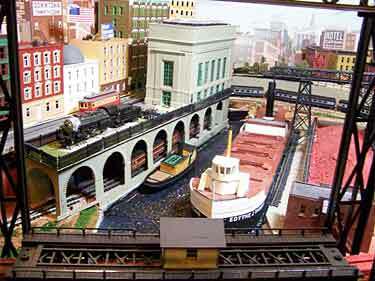 Model railroad layouts, especially small ones, are often set in rural or semi-rural areas where small structures and industries are located and there are plenty of interesting natural features like rivers, forests and hills. But there’s an excellent alternative available in the center of any city — big structures that dwarf our trains and many fascinating scenes and details. Whether you call it Downtown, the High Street, or the Centrum, there are plenty of prototypes for exciting small layouts in the middle of town. Here are a few good examples. NO TREES GROW IN THIS PART OF BROOKLYN! To begin with some urban inspiration, here are a few under-construction photos of a new layout by Prof Klyzlr, from Sydney, Australia. The Prof began by adapting Jack Trollope’s plan for Pine Ridge II, moving it from northern Ontario to the Brooklyn waterfront (supposedly 2nd Avenue at 41st Street). 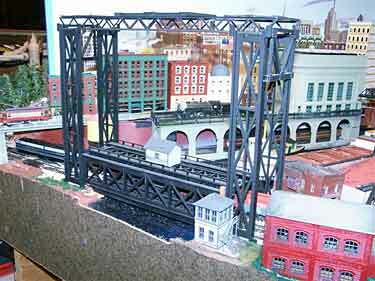 He kitbashed Walthers city structures to make the towering scenery and scratchbuilt the overbridge, which hides a three-track traverser fiddle yard. 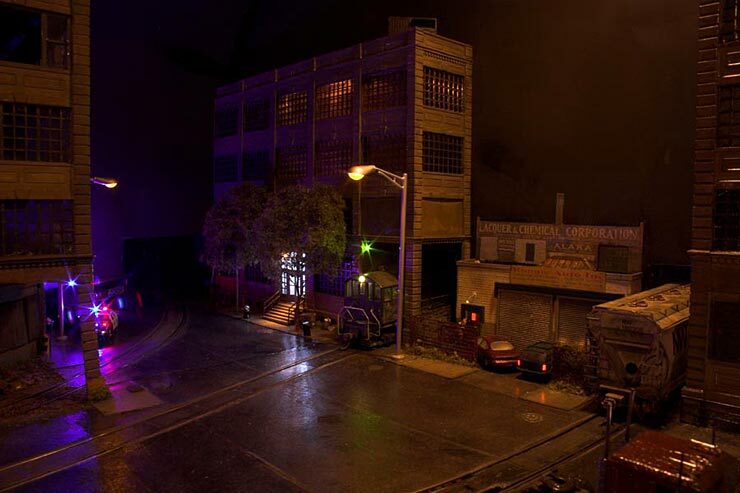 The impetus for building Brooklyn: 3 AM came from the Prof’s desire to build a “rainy, nightime scene.” He’ll be breaking new ground (no pun intended) to model a cityscape at night, with wet surroundings everywhere and fog creeping in from the harbor. Photos of the “stage” and bare trackwork for this inspiring road are in Scrapbook #58. Stay tuned for some exciting future developments! 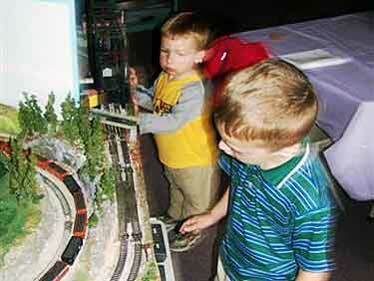 Prof Klyzlr has long been known for his pioneering work in exploring new avenues for model railroading fun. You may want to check out some of his past breakthrough work in such testbed layouts as Dynamite Canyon and Camp 4. 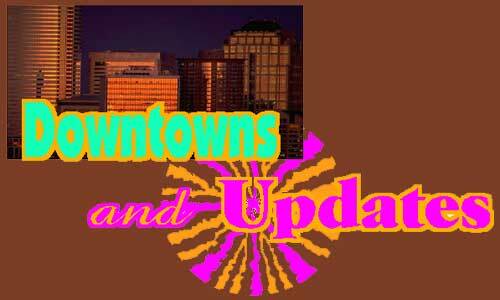 At the other end of the size spectrum is the smaller-town center, referred to in Britain as the High Street. Modeling this often-quaint commercial strip is a time-honored device for adding interest and charm to British station layouts. A good example is Southery, built a few years back by Giles Barnabe, who lives in London. 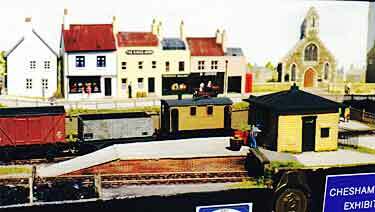 Giles explains, “I built Southery to test the viability of modelling the British scene in HO scale (1:87). The layout measured 60x15in (150x38cm). 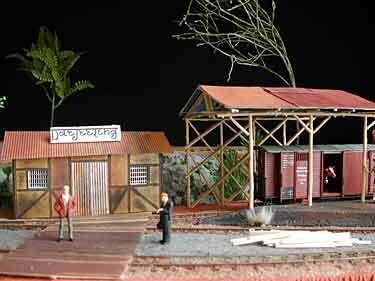 It would have needed 72x18in (180x45cm) in our more-traditional OO scale (1:76). Herman Steyn, who lives in South Africa, has long fancied a waterfront layout featuring the interesting warehouse fronts found in Hamburg and Königsberg (now part of Russia and called Kaliningrad). 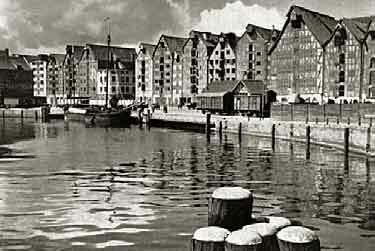 Before WW2 the Königsberg warehouses (above left) were particularly attractive, with the trains running between them and the water. Because of limited room, Herman opted to construct a portable micro layout in the space of two A4 letter-sized sheets of paper placed end to end and measuring 294x210mm (8.3×23.3cin). 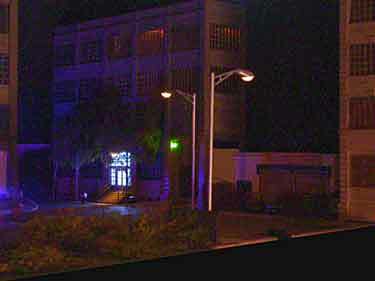 The initial layout mockup is shown (above right). 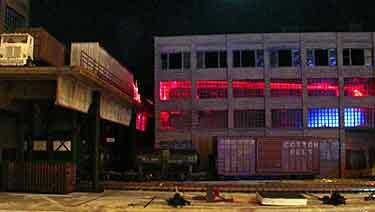 Using information from a book about the Königsberg warehouses, Herman constructed templates on his computer and is building the warehouses from printed patterns using 3mm Kömaplus (rigid PVC foam sheets). Kömaplus is generally used in the signage industry. 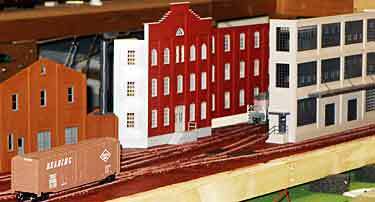 Herman plans to use a cassette arrangement as the fiddle yard for this tiny railway. When I saw this delightful little layout idea, I immediately was struck by a notion to further enhance the setting. Still using Herman’s choice of Märklin K-track (HO three-rail AC), I suggested the plan at right. It allows the tracks to be longer and hold more cars, increasing switching capacity, and it largely frees the spurs from paralleling the front edge, increasing the sense of space and openness. Herman is now rethinking his original design. Watch for new reports! 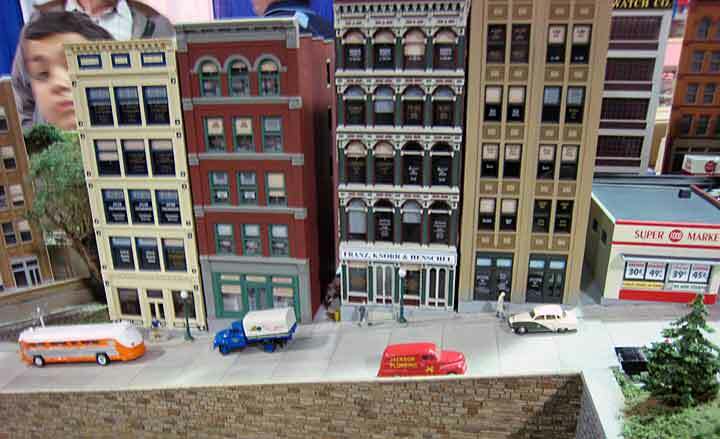 These two photos, which I took at a recent World’s Greatest Hobby train show in Pittsburgh, show closeup details of one corner of Jim Sacco’s HO display layout for City Classics structure models. 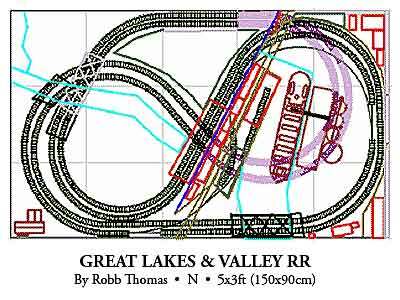 The layout description and track plan are in Scrapbook #38a. I include these two shots here to illustrate how easy it is in a very small space to convey the feeling of a major city with a railroad running through it. 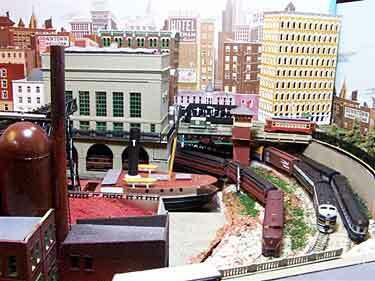 For some reason, I like this kind of “railscape” even better than the rugged Rockies or lichen-covered Appalachians that so often appear in layouts shown in the model magazines. Rich Bohlman, from Pearl, Mississippi, is not only making his HO shelf layout in the middle of town, he’s picked a particular town for it! 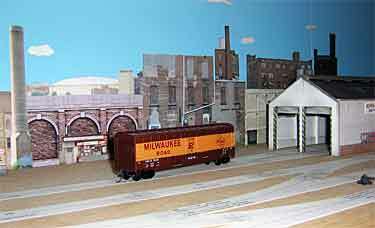 Rich is modeling the old Milwaukee Road in central Milwaukee, Wisconsin, USA. His goal is to make the backdrop and structures entirely from paper and card. Looking very much like a narrow-gauge railroad built inside an Impressionist painting of a village center is Porte d’Étropal, built by Englishman Simon Dawson. These are Very Large Scale trains — 1/12 full size, where 1in = 1ft. The human figures are about six inches tall (150mm)! This layout is built on an old wallpaper pasting table measuring about 1.8×0.5m (71x20in). The backdrop is an original painting by Simon, representing the town of Porte d’Étropal, an inland port somewhere in France where gravel is loaded into railway wagons from boats (not seen on layout). 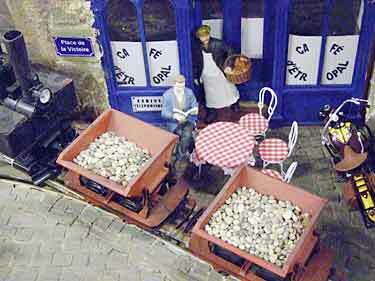 The full wagons are shunted across the layout so they can be unloaded in the fiddle yard area (behind the café). 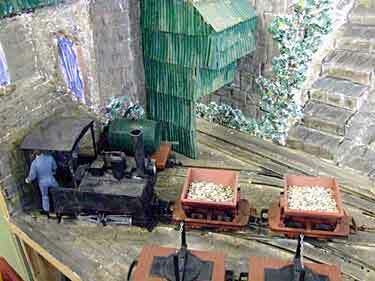 Then the shunting operation is reversed so the wagons can be refilled under the hopper (below left). Rolling stock is adapted from LGB G-scale equipment. 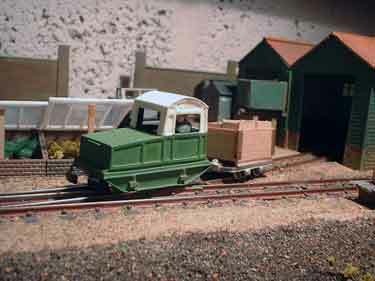 Simon scratchbuilt the classic little Decauville four-wheeled loco on an LGB mechanism. Track is stock LGB G-gauge. Simon is currently adding fine details, getting the layout ready for its first exhibition in October. You can see more of Simon’s unusual work at his website. By eliminating virtually all trackage except a winding double-track main line, Robb Thomas, from Walkerton, Indiana USA, has managed to squeeze both a credible country scene and a bustling port metropolis into a 5x3ft (150x90cm) baseboard. The port is located in eastern Ohio on Lake Erie, and the countryside represents an Appalachian valley in Pennsylvania. 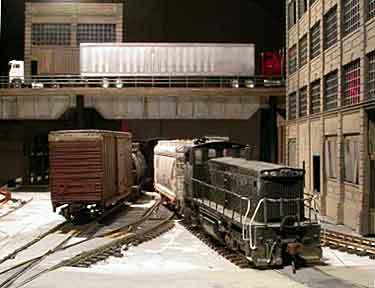 A diagonal backdrop separates the two scenes on this N scale railroad. Robb comments, “I had known I wanted a Great Lakes Ore Boat and tall buildings in my city back in 1991 when the project began. 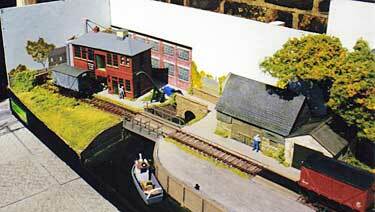 By 2003 there was an N scale 254-foot Laker ore boat available. 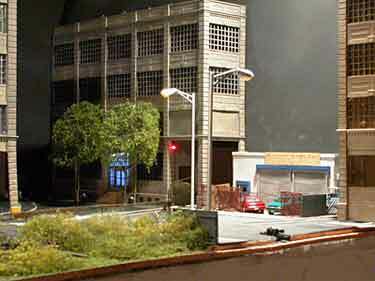 At the layout’s first public appearance this kit sat with some Model Power buildings on bare plywood in the city, showing what someday might be. Since then the city has grown with the addition of more realistic DPM buildings, and my employment sailing on the Great Lakes led to the construction of a double track lift bridge made with readily available HO scale bridge parts. We often run stories in these pages about layouts under construction. Usually it’s because they are built around an interesting idea that we want to share with you, and the road is far enough along to demonstrate the idea. But time marches on, and all layouts have a way of changing and improving as they develop. So we also bring you updates of layouts that we’ve covered before, to see what’s new and to capture some more good ideas. Here are a group of excellent examples! It was in Scrapbook #53a that we first told you about the switchback layout of Alexander Kaczmarek, from Berlin, Germany. He’s building an On30 version of the famous Darjeeling Himalayan Railway on a 210x45cm (83x18in) shelf. These photos are an update of his progress is creating “Indian-looking” scenery — despite never having been to India! Alexander comments, “Sanjay Gupta’s Tea Factory is made from plaster and wood. The station building (perhaps known as the station building from Sans Pareil, my former H0 layout) got new colour and new doors (due to the fact that 0 people are taller than their H0 relatives…).” Looks good to me, and I admire Alexander’s ingenuity! 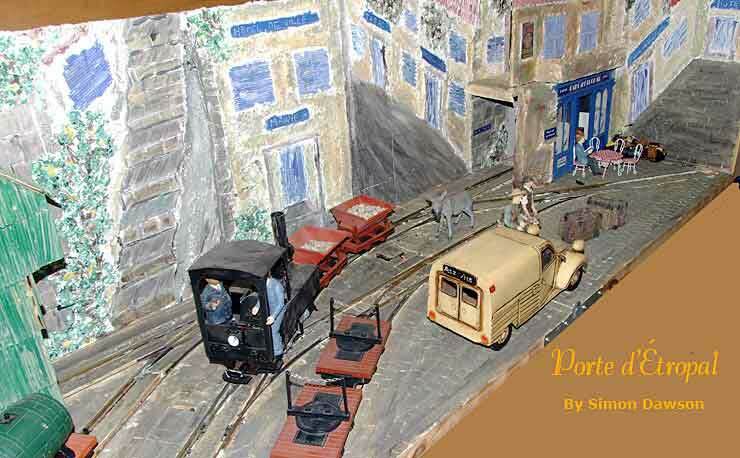 Fabrice Fayolle, from Amiens, France, has been working on his portable N-scale American layout, Point Davis, for over a year. He’s now taking it on the exhibition circuit, and in this photo he and his son, Joseph, have just finished setting up for a show. Track plan and photos of Point Davis can be found in Scrapbooks #42, #45, and #48 … as well as at Fabrice’s website. There are many more photos of TPY available at Versif’s website. 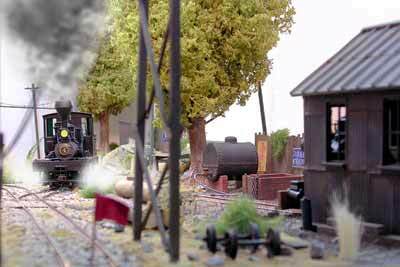 Chris O’Donoghue, from near Rye, England, reports at last about his little 009 layout, Wills Walled Nursery. Things have changed! 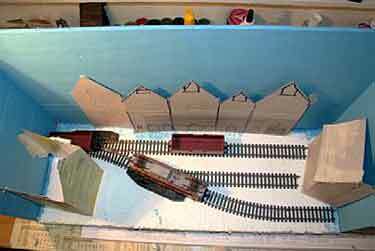 “In 2004 a piece I had written about a new layout idea was included in the August Scrapbook [#28]. This was the genesis of Wills Walled Nursery. 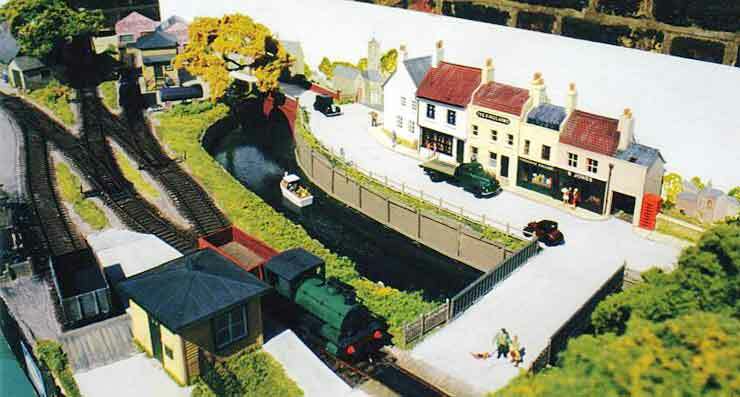 As a different competition was to be held at ExpoNG in 2005 for a layout to fit inside a ½ metre cube, a couple of inches was cut off the end of the layout. Voilà, one competition entry was ready to be worked on. “The traverser inside the glasshouse was made from a thick sheet of Perspex [Plexiglass] sliding on the ply base, and a single road MDF (fiberboard) sector plate was installed within the large potting shed. Groundwork consists of gravel (Camber Sand left over from Nottery Quay mixed with N gauge ballast), and the track is buried in the ballast. Much use is made of various scatter materials and ground foam and two trees — one proprietary, one home made — hide the fiddle yard. In all, 64 flowerpots made of modelling wax hold ground foam plants growing in the cold frames. Boxes and open wagons are fabricated from single ply and filled with wax vegetables. NARROW GAUGE TENDS TO TAKE OVER! Many model rails have commented on the tendency of narrow gauge lines — those “Cute Little Trains (CLTs)” — to take over once they’ve insinuated their way onto your baseboard. Brian Wilson, from Victoria, BC Canada, has experienced exactly such a power grab. After introducing his little O-scale shelf layout, Moore’s Yard, in Scrapbook #53a, Brian decided to add a narrow-gauge spur leading to the turntable (shown in Scrapbooks #55a and 57). When that On18 spur was added to the existing On30 narrow gauge and traction lines, the shelf looked like the photo at the left (labeled “THEN”). 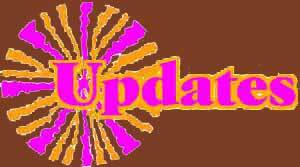 To keep abreast of this fast-breaking story, follow progress on Brian’s website. Or keep an eye on future issues of this Scrapbook!